On 8 December 2002, a roundtable discussion was held with members of the Action Committee for Non-Status Algerians (Montreal), the Ontario Coalition Against Poverty (Toronto), and No One Is Illegal (Montreal). In this transcription of the discussion, the non-status Algerian refugees share their experiences of living in Canada with-out formal status, a situation which they characterize as being degrading, unliveable, and absurd. The participants discuss the possibilities for organizing opposition to increasingly restrictive and repressive refugee and immigra-tion policies. They examine the viability of anti-deportation campaigns, direct action casework, and the prospects for a broad-based movement in defence of refugee and migrant rights. 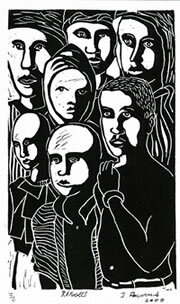 Le 8 décembre 2002 a eu lieu une table ronde réunissant des membres du Comité d’action des sans-statut Al-gériens (Montréal), la Coalition ontarienne contre la pauvreté (Toronto) et No One is Illegal (« Personne n’est illégal ») (Montréal). Ce qui suit est une transcription des discussions qui ont eu lieu, au cours desquelles les Al-gériens sans statut partagent leur expérience de la vie au Canada sans un statut reconnu, une situation qu’ils qualifient de dégradante, invivable et absurde. Les par-ticipants examinent les possibilités d’organiser une oppo-sition aux politiques en matière d’immigration et du traitement des réfugiés qui deviennent de plus en plus répressives et restrictives. Ils explorent la viabilité des campagnes anti-déportation, l’action directe et les possi-bilités d’organiser un mouvement rassembleur pour la défense des droits des réfugiés et des migrants. On 20 October 2002, an Algerian family facing imminent deportation from Canada – Mourad Bourouisa, Yakout Seddiki (who was fifteen weeks into a high-risk pregnancy), and their two-year-old Canadian-born son, Ahmed – made international headlines by taking sanctuary in a downtown Montreal church. Like thousands of other Algerians, the family had fled violence and conflict to seek refuge in Canada. But while their individual claims for refugee status were rejected, they had remained in Can-ada. They stayed because the situation in Algeria was so dangerous that Immigration Canada prohibited all removals there – that is, until April 2002, when the moratorium on deportations was lifted. This move came on the same day that the Canadian government issued an advisory warning its citizens not to travel to Algeria. With an end to the moratorium, approximately 1,069 Algerians whose refugee claims had been denied were to be returned to a country deemed too dangerous for Canadians. The timing of the lifting of the moratorium also coincided with the Canadian Prime Minister’s trade mission to Algeria that drummed up millions of dollars in trade between the two countries.1 The case of the Bourouisa/Seddiki family became a rallying point for campaigns opposing deportations to Algeria. The Action Committee for Non-Status Algerians (a self-organized group of Algerian refugees in Montreal) stepped up their campaign to raise public awareness about their situation and to organize a political and legal response. Eleven days into the Bourouisa/Seddiki family’s flight into sanctuary, the Canadian and Quebec governments responded to this so-called “extraordinary situation” by granting a ninety-day stay on deportations and an opportunity for all non-status Algerians to make in-land applications for permanent residence. This concession fell far short of a general amnesty as it excluded those who: lived outside of Quebec; had a criminal record, however minor; had already received deportation orders or had been deported; and could not afford to pay the expensive application fees. Undeterred, the non-status Algerians, together with allies, have continued to fight for their right to stay in Canada. Their demands to the Canadian and Quebec governments are threefold: (1) an immediate end to all deportations; (2) a return to the moratorium on removals to Algeria; (3) the regularization of non-status residents in Canada. The situation facing the non-status Algerians is not an isolated one. The Canadian government is no stranger to the global trend of tightening borders, restricting mobility, and criminalizing asylum seekers.1 However, these anti-refugee and anti-immigrant measures are being actively challenged and resisted by refugees, immigrants, and their allies. On 8 December 2002, Michelle Lowry and Peter Nyers, the co-editors of this special issue of Refuge, held a roundtable discussion with a number of such activists in Canada. Soumya Boussouf, Mohamed Cherfi, and Nacera Kellou from the Action Committee for Non-Status Algeri-ans were joined by Jaggi Singh from No One Is Illegal (Montreal) and Stefanie Gude from the Ontario Coalition Against Poverty (Toronto).3 We asked them to talk about living without status, organizing resistance, and the possibili-ties for a broad-based refugee and migrant rights campaign. Before we discuss the topic of activism, could you explain what it is like to live as a “non-status” person in Canada. Mohamed: For me it is really difficult. I am someone who at the beginning didn’t speak a lot. I was really depressed. I didn’t take it really well. For example, when I was at my home I kept the lights on because I have nightmares. It is not something that is easily explainable. I’ve thought of suicide, I’ve thought of very extreme things. I was before a machine that was going to roll over me, and there was nothing I could do about it. Nacera: For me, it was also very difficult. When we made our refugee claim we thought we had good chances. People told us, “You have children. It shouldn’t be a problem.” We thought things would resolve themselves. But after two years they weren’t resolved. We were living in stress. It wasn’t liveable. As a family, as a couple with children, everything was destroyed, everything was disrupted. We come from a culture where family and children are important and our day-to-day life was disturbed – it was disrupted. Our sense of living, our sense of life, our sense of reflecting on things – that was all lost. When our kids ask us about things, we think, “Are we saying the right thing to them? What are we saying? Does it make sense?” We are lost, and it is really difficult to live like that. When everything in your life is in doubt, is up for question – that’s difficult. To have a normal life as a parent, it’s not possible. We will never get back what we had before, that lost time when our kids were growing up. Soumya: I think it is important to note that most of us didn’t know what “non-status” meant before we came here to Canada. I personally didn’t know what it was. I had never heard of it before. When it happens to you, even then it takes you a lot of time to realize what it really means in your everyday life. For example, I came here with my husband; it has been over three years now. We claimed refugee status and we got denied. But there is a moratorium on deportations to Algeria so they allow you to ask for a work permit that you have to pay for every year. We asked for our work permit and started to have a normal life. It’s biding time: you start to work, you start to have friends. After a year, two years, you are involved in many things. When you really realize that you don’t have status is when you decide, for example, to take action and say let’s study. For example, you go to university, I personally did. I was very proud of myself and I said, “OK, I am going to get a certificate in accounting because I like it.” I went to McGill University and the person there said to me, “I am really sorry but it says on your work permit that you have no rights at all to study here. If you want to study then you have to apply for a study permit at Immigration Canada.” If they give it to you, then you have to pay foreign fees, which is much more. Nacera: To me a refugee arriving in Canada didn’t come easily. It’s not easy to get here. In fact, they came with risks: falsifying papers, going through borders, etc. I went through that; I know what it means to go through that. We come because we want to save our lives, to have lives. It’s not easy to tear yourself away from your home, where you’re from, the people you know, etc. We don’t do it because it’s fun or because it’s easy. It’s hard. Soumya: When the moratorium was lifted in April last year, everybody started to worry very seriously. We all started to receive documents from Immigration Canada –the Pre-Removal Risk Assessment (PRRA).4 When you receive such documents your whole world crashes. Personally, I gave up my work. I couldn’t speak to anybody anymore. I couldn’t eat. I started to take pills to sleep. In the beginning it was one, then two, and then it is just a night-mare, because you just don’t know what is going to happen to you. You are like, “Oh my God, what am I going to do?” And, nobody can help me: that is the worst. You feel like you have to fight against a whole system. It is very hard psychologically. Of course it affects you, your family, children – it affects everybody around you. It is very difficult. How are the non-status treated by Canadian officials? Mohamed: To show how we are treated, I will give you one example. Now, I left Algeria in 1996. I found out that my father died and I couldn’t go back because it was too dangerous. When I was before the Immigration Board, I was asked, “Why did you lie about when your father died?” I was mistaken about the date because I wasn’t there. I was so upset at this question, and this line of questioning, I cried. The lawyer should have intervened, but he couldn’t because this is the process. But this is a question of dignity. It was an undignified thing to ask me and to say that I would lie about my father’s death. But you can’t denounce it. This is a crazy system. Acera: We don’t speak the French of Quebec. We speak “French French” or “Algerian French.” Generally, when we arrive here and need to get on welfare, the Canadian officials do everything they can to show you that they can do what-ever the hell they want with us. The welfare agents – they talk to you like they are paying out of their pocket to you. They’re arrogant. They treat you like you have no values. They explain points, but when you say to them, “Look, I don’t understand,” their response is: “Listen. I told you, I already told you,” in a very arrogant way. If you insist that you didn’t really understand, the response is: “Listen. Now speak softly. Don’t get upset. Don’t scream.” I had my welfare stopped because of this for a month. This is when I had no work and I had small children. This is absurd. They really do everything they can to devalue you. They once sent me a letter that my welfare agent made a complaint against me. I needed to respond to this. If you don’t respond it could be put in your file and it could have bad consequences for your eventual immigration status. So they obliged me to see a social worker to work this out. Jaggi: Nacera said that welfare workers wanted her to speak softly and not scream. Now obviously any given tactic is useful or not useful, and sometimes it’s cool to speak softly and not scream. But the fact is that we’ve made a fetish out of speaking soft and not screaming. And we need to scream. We need to speak loudly. And again, even sometimes when you’re not even doing it – like, asking a critical question to an Immigration Minister. A critical question. Or being a little bit loud with your voice to assert yourself. These are things that are looked down upon. That relates to a phrase or an expression that’s really crucial to a No One Is Illegal analysis of immigration and refugee issues – and that’s self-determination. We look at self-determination in a classic sense of communities defining their identity, whether it’s indigenous communities, or the Palestinian people, etc. But self-determination happens on individual levels all the time. The immigrant experience and refugee experience are profound acts of self-determination. The important point is that any campaign has to be based on the lived reality of immigrants, refugees, non-status, of illegals, of people on the front lines. Their lived reality. And that lived reality, again, is about fake passports, the indignities, all the things to do with the system. But also that lived reality is that these are acts of self-determination. The moratorium on deportations to Algeria was lifted in April 2002. How did the non-status Algerian community in Montreal respond? Mohamed: We are here and we weren’t accepted as refugees. But at the same time we couldn’t be deported because of the moratorium. We are in a difficult situation all the same because, for example, we have limited medical services and it is difficult finding work because the Social Insurance Number starts with a special number (the number 9). Plus, there is all the uncertainty of not knowing whether you are going to stay, or whether you are going to go. It is a very ambiguous, uncertain, precarious kind of situation. The Action Committee for Non-Status Algerians was created at the beginning to regularize this situation. And now we are at risk of actually being deported. So the committee got more activated and more engaged because of this and we added demands. Those demands include not just regularizing our status but also returning the moratorium and stopping deportations. There are various levels on which we’ve been mobilizing. The first level is to mobilize people who are concerned themselves, the non-status. Secondly, we raise awareness amongst the public. For example, we organize weekly pickets in front of the offices of Immigration Canada. Since the lifting of the moratorium, we’ve been there every week. Flyers, tables, and conferences; we have been invited to universities and community radio. To give one example, we went to the St. Jean Baptiste celebration where we passed out three thousand flyers in one evening. It might not be that people know the details, but at least they know that non-status people exist as a result of this activity. We have also done a lot of media work: the organization of three or four press conferences, press briefings, etc. In October 2002 things sped up quite a bit. Immigration Canada said that about thirty-two people had already been deported. But we didn’t know who these people were. There was, very specifically, the Bourouisa family that was to be deported on October 20. That activated us; that got us moving. That date – October 20 – became a very important date for us. About the people who have been deported, Immigration Canada says you know there is no danger to go back to Algeria because nothing happened to those people. But there’s no way of knowing what happened to them. There’s nothing in place to monitor what happened. To return back to the story of the Bourouisa family: This family learned that they were going to be deported on 11 September 2002. They learned then that they would be deported on the 20 th of October. This family is a husband and wife and their two-year old son. The woman is pregnant. The son who was born here in Canada has a Canadian passport and Immigration Canada told the family that they should get the proper papers for the son to be returned to Algeria. Otherwise, he would be kept in Canada separated from his mother and father. This is terrible. This woman was pregnant. As we all know psychologically there’s already all kind of things someone has to deal with when they are pregnant. And, what this family did was they lived with one month of torture between knowing whether they were going to be deported and their deportation date. They lived with these threats. People shouldn’t have to live through that. That should not have happened. It was terrible. What role have women played in the Action Committee? Soumya: The Women’s Committee was created September 2002 and it’s actually the result of our experience in the Action Committee. We noted that there were more men than women. Nacera – she speaks to a lot of women on the phone – and they were telling her, “Tell me what’s going on because my husband went to the last meeting, but all he’s telling me is ‘don’t worry,’ ‘everything is going to work out,’ and ‘it is all right.’ But I want to know. I really want to know what happened and what’s going on.” So we decided to create the Women’s Committee. Nacera: The first thing we did as women was we had a meeting. There was panic at that first meeting. Everybody was crying because we asked people to speak about all the things they felt about what was happening. That is how it was expressed: panic and crying. Many of these were women who don’t go out of the home a lot, either because they have kids and are limited, or others because they have husbands who maintain a certain tradition from the country, which is that the husband goes out and does all the things that need to be done and the woman stays at home. For example, we organized a Women’s March and when we were planning the route for the Women’s March we would get reactions like, “Oh no, we can’t go there because my husband hangs out in that café.” Or “No, we can’t go there because my husband works in that area.” So those are some of the challenges that we face. What kind of actions did you organize to fight the deportations? Nacera: The first action that the Women’s Committee did was to visit the riding office of Denis Coderre in Montreal. We did the delegation in support of the pregnant woman, Yakout Seddiki, who was facing deportation. We were saying to ourselves, “Here is a woman, pregnant, she’s lived here for several years. And if this family is deported we don’t stand a chance.” So we wanted to put some pressure on through this visit to the office. We didn’t succeed in getting to talk to Denis Coderre; we had to deal with one of his assistants. They were hard-headed. They were telling us, “Give us your letter and we will get back to you.” They didn’t want to speak to us all at once. They were saying, “This is not the way things are done in Canada. We don’t do it this way.” We stayed all day, and we wanted to stay. We all ended up expressing to the people in the office how we felt. And many women who told their stories were overcome by tears. And even the office secretaries had tears in their eyes as they listened to the stories as told by the women. The second action was the Women’s March that happened on the 12 th of October, with the help of lots of support people. It was a demonstration of about five hundred people that was led by women and children. And then, we did another delegation which was one week after that first delegation visit to Denis Coderre’s office. But this time it was to the Immigration Canada headquarters in Montreal. We visited on Friday, October 18 th , organized by the Women’s Committee, but also made up of men – about thirty people. Because the deportation of the family was going to happen on October 20 – on Sunday – we said to ourselves, “We must do something.” So we decided to organize this visit. The Immigration officials – they wanted us to provide the good respectful image: that we’d come in, and we’d go upstairs, and we’d sit down, and we’d wait, and we’d talk to them like things are normal. But things aren’t normal! This was panic, and we acted in such a way. We occupied all the rooms to show that this was a serious situation. They didn’t want the other people [i.e., other refugees] in the waiting room to see us because this would dirty up their image. This would take away from their image of their administrative life, of things being done normally. This would ruin that. So that’s how we approached it. Jaggi: The ability of immigrants and refugees and illegals and sans statues to fight back is really important. It is a process of empowerment. This is why they didn’t want people in the Immigration Office to see other immigrants fighting back. When people hear those stories they are empowered, they don’t have to be passive, they can do something. And this is something that we’ve all observed working as allies with the Action Committee for Non-Status Algerians. First of all, members of the Women’s Committee were saying before the first visit to Coderre’s office, “I wonder: Can we do this? What’s going to happen?” After-wards, when I went to the Women’s March, and I had a newspaper article on the action, all these women who I had never seen were surrounding me and were looking at the article and saying, “Yeah we did something.” It made a difference; it was empowering. These tactics – delegation visits and office occupations –have also been successfully employed by the Ontario Coalition Against Poverty (OCAP) in its direct action casework. Stef, can you talk about this strategy, both in terms of its effectiveness and limitations? After the initial connection we refer people, if possible, to a legal clinic system. But that legal system is already very strapped. There are immigration lawyers in Toronto and there are legal clinics that take on immigration cases. But many legal clinics aren’t at this point. They have moratoriums on accepting cases. There are obviously limitations to getting legal aid depending on what your situation is, like how far gone you are in terms of being persecuted by Immigration. We also have worked with a lot of people that have had extremely bad counsel, often by immigration consultants. Lots of them used to work for Citizenship and Immigration and have quit that job and gone private and now do immigration consultation for people. I worked with a woman who was stripped of a good $8000. The consultant filed a humanitarian and compassionate claim, but didn’t include all her children on the claim. He did extremely shoddy paperwork and filing, and got as much money out of her as possible. He was contacted by Enforcement and was told that this woman had an appointment at the Enforcement Centre. He called her and said, “I know people on the inside, just come to the appointment and I’ll smooth it over.” But what he actually did was turn her over to Immigration to get a tip-off fee: you get a small amount of money for turning people in who are wanted by Immigration. He was well aware that this was the situation. She was in detention and he then charged her for the cost of her plane ticket. He managed to strip her of $5000 to $8000. Luckily she was released, and we are now working with her. But that happens to people over and over again. In those situations, we start by filing good, thorough claims. Claims that people can help work on themselves as well. Depending on the situation, our advocacy or political action begins at the level of phone calls and letters. But oftentimes we have to go to the delegation level. We have a long-standing reputation for filling the offices, the back rooms, getting the security doors of offices open so that the office can no longer function. Bureaucracy relies on the fact that things will always go in a particular way. If you fill a room with 150 angry people, including the back offices, business as usual is no longer possible. Bureaucrats that sit with those files that have ID numbers only know people as an ID number, not as human beings. We operate on the principal that people have to meet face to face. If, for example, an Immigration Officer has to explain to a mother of five facing deportation to Somalia where her two eldest children are going to have to undergo genital mutilation why the deportation is happening – it does in some instances get results. Private corporations are making profits off deportations and detentions. Have your campaigns targeted these private interests as well? Stef: In terms of corporations and exposing who benefits off the business of removals, we have had some success with airport actions. We had an action where there were three deportations pending and people went to the airline – Air Canada, which facilitates and makes money off of deportation – and did a mass leafleting to make people aware of the fact that you could potentially be sitting next to a deportee. Jaggi: About airport actions. There are things, I think, that are useful to mention about strategy and tactics. We did do a visit to Dorval Airport in Montreal on the day that the Algerian family in question, Mourad Bourouisa and Yakout Seddiki, were to be deported. We handed out a flyer drawing attention to what we call the “deportation business.” There is a very well-developed campaign against airlines in Europe – extremely developed because there have been some atrocious cases in Europe of people being killed as they’re deported. For example, pillows are placed on their heads to calm them down, and someone suffocated. In other cases, people are forcibly sedated and end up dying. And there are also mass deportations and mass flights out. In our research around the Algerian case, an Immigration Canada spokesperson in Quebec went out of their way to say that “We’re civilized. We would never have mass flights. We are not going to be putting all the Algerians on one flight and sending them off. They are on a commercial flight.” They said that the only time we ever did a mass deportation in recent Canadian history was with about forty or fifty Chinese migrants after the boatloads came in 1999. So we focused on the deportation industry and handed out a flyer that drew attention to certain airlines that we knew did deportations. But this is something that needs to be more developed. What is the long-term viability of a direct action case-work model? Jaggi: Strategically speaking we have to say a few things about tactics. We shouldn’t be doing direct action case-work. In so many cases it’s just about having a competent lawyer, it’s just about filing the right claim, it’s just about gathering the right information. It is about services and resources. And so us direct action caseworkers, like Stef and me and Mohamed and others: we’re not lawyers. We just know where to look. Sometimes it’s paralegal work, some-times it’s finding money, sometimes it’s making sure some-thing gets in on time, sometimes its patting someone on the back. But that’s not terribly sustainable if you look at all the cases that need to be dealt with. Stef: We agree. We are at a point where delegation-wise, immigration offices in Toronto are now rigged with alarm systems. They have signs behind the desk that say, “This is what you should do if a delegation arrives.” The police do get called. The offices continuously send out PR hacks to deal with us. We can only send delegations to things so many times. How feasible is that as a tactic? After all, the new Immigration Act has come into effect this year. The Safe Third Country agreement has also been passed. The fact is that people aren’t going to have the opportunity to get in easily, never mind the hassle and haggle and struggle from within our borders. The fact is that I have no idea how many people never even have the chance to call our office. The way that screening and the way that the laws are being worked now is an attempt to prevent entry. How can we best be allies in something that has to expand beyond casework? I’m not saying it’s a bad thing that people are using the casework model that we’ve promoted over the years. But we can’t just keep on doing this. We don’t have the resources; it doesn’t make sense. Jaggi: As Stef was saying, a casework approach needs to be thought of strategically. Because ultimately that tactic might lose its force. In Montreal, for example, we are always saying to ourselves: we could do a direct action casework visit everyday – literally. I remember one period we almost had it planned that we would be visiting offices three times in the same week. And we were saying to ourselves: Will this lose its effect, its punch? Because part of the effect of it is that there’s something specific about this case that demands your attention right now. But the fact is that we could do that every day with so many cases. What do you think, then, are the prospects for a broad-based movement in support of refugee and migrant rights? What direction should the movement take? Jaggi: The traditional tactics just aren’t working. I mean, they are actually an abject failure. They try to work within a system, to basically humanize a system that is essentially inhumane. To give one example, the Action Committee for Non-Status Algerians were criticized by more of the main-stream groups for being a bit too radical. “How can you call to end to all deportations? How can you say, return the moratorium? You have to ‘sugar-coat’ your demands so that the government will look good as they respond.” Of course, that is a tactic that can exist. But why are you criticizing people for standing up for what they believe? You “sugar-coat” it when you do your work. But it is as if we have to all subscribe to one notion. I think we need to talk and adopt various tactics to the broader strategy of making some fundamental policy changes: the regularization of all, amnesties, the treatment of migrant workers. Mohamed: People who are directly affected need to be the ones fighting and creating this movement with allies. We need to be radical. That is the best way we are going to grow and be effective. When the government gives us just a little bit, a change of policy – for them, that’s a big deal. They say, “See what we’re doing!” But it’s not such a big thing. We need to prevent laws from being passed. For example, the Immigration and Refugee Law that was passed in June the response was very soft. There were no real big protests. We need to mobilize. We need to prevent these laws from happening. We need to be there at Parliament when they try to pass these laws. And of course, the context here is that these laws legally make us weaker. We have to get to them before they pass laws that make us weaker, that affect our status. Stef: If this is going to be a successful mass movement, then the allies that are onside have to be genuinely onside. OCAP Immigration had traditionally been supported by union flying squads and had received funding from a large Canadian union. When OCAP stepped up its militant tactics, then that support was withdrawn. That’s not legitimate alliance building. That’s not real ally work. If this is going to work then people really have to be standing there. We called a demonstration around the passing of the new Act, and the attendance of that demonstration was thin. The union flying squads weren’t there. People purport to be allies; so when the tactics are harder and when people are pushing things, you have to be still willing to stand there. You have to still be willing to say that you think that this is worth fighting for. See Sue Montgomery, “Tears Linked to Water Deal? Deportation Seems to Make No Sense. Big Water Contract Was An-nounced about the Time Canada Decided Algerians Should Leave,” Montreal Gazette, 19 October 2002, p. A7. For an elaboration on the situation in Canada, see the article by Cynthia Wright in this issue. All participants gave consent to have this roundtable tape-re-corded. Several participants spoke in French and had their comments translated by Jaggi Singh and Salma Ahmad. Minor editing for grammar and length has been done by the editors. All participants were provided a copy of this roundtable for their review prior to publication. Michelle Lowry is a Ph.D. Candidate in the Graduate Program in Women’s Studies at York University, Toronto, Canada. Peter Nyers is a SSHRC Post-Doctoral Fellow in the Department of Political Science at the University of Toronto, Canada and teaches at McMaster University, Hamilton. The Ontario Coalition Against Poverty is an anti-poverty organization based in Toronto, Ontario, Canada.